To see the filters for a visual, choose Filter on the tool bar. The filters that apply to the selected visual display. They appear in the Applied filters pane in order of creation, with the oldest filter on top. 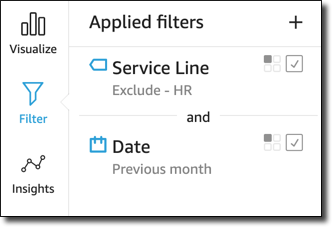 Filters in the Applied filters pane display icons to indicate how they are scoped, and whether or not they are enabled. A disabled filter is grayed out, and its check box is disabled. One of several scope icons displays to the right of the filter name to indicate the scope set on that filter. The scope icon resembled four boxes in a square. If all boxes are filled, the filter applies to all visuals on the analysis sheet. If only one box is filled, the filter applies to the selected visual only. 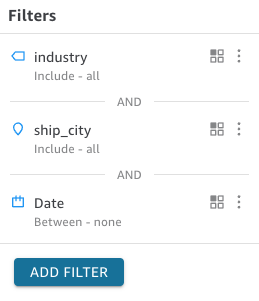 If some boxes are filled, the filter applies to some of the visuals on the sheet, including the one currently selected. These scope icons match those displayed on the filter menu when you are choosing the scope for the filter. To see filter details, choose Filter on the left. The filter view retains your last selection. 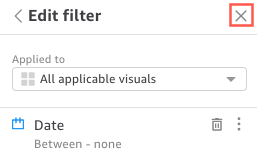 So when you open Filter, you see either the Applied filters or the Edit filter view. In the Applied filters view, you can choose any filter to view its details. The filters in this list can change depending on the scope of the filter, and which visual you currently have selected. You can close the Edit filter view by choosing the selector on the right. Doing this resets the Filter view.